Yes! Seeing as the November Wildside is the closest weekend to Halloween we’ve decided to theme the night around it! 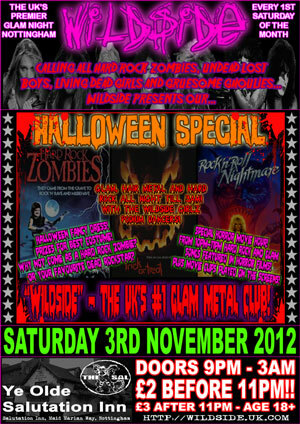 Calling all hard rock zombies, undead lost boys, living dead girls and gruesome ghoulies….. get your fancy dress on! Bonus points for dressing as your favourite dead rockstar (…always in good taste is Wildside!) and prizes to be won for the best costume! And for a special hour (10pm-11pm) we will be only playing hard rock and glam songs from horror films … so expect some “Dream Warriors”, “Bring Your Daughter To The Slaughter”, “Pet Cemetary” and many more … from such bands as Alice Cooper, WASP, Fastway, Vinnie Vincent, etc! Of course it’s not all tacky Halloween overload – no – there will be the usual incredibly tacky and cheesy glam all night too! With your resident DJ Wildside and the Wildside Girlz on the podiums of course! All till 3am and with a super cheap entry of £2!! (Before 11pm). Entry is free downstairs with DJ Johnny Fangz doing a great mix of classic rock and metal. But get there early though to hear some rare and usually unplayed glam classics!! The venue is of course The Ye Olde Salutation Inn on Maid Marian Way.